It is used whenever the noun is an attribute of another noun, regardless of whether this is possession or some other type of attributeness. It is used when the noun is a complement of copulas and the like. It is used when forming compounds, regardless what case the compound normally would take the noun in. This case only appears as a plural case with two nouns, warga-n (pl. warg-umu), mountain, and märsi-n (pl. märs-ümü) autumn. For most other nouns, the plural forms restore the regular case system. They all end in -n, but not all nouns ending in -n end in an -n absolutive marker. In some dialects, this case is also used with intransitive subjects, and as object of imperatives. In eastern dialects, it has generally been completely lost. Welcome to the 9th edition of the Language Creation Tribune. Summer is coming (at least for those in the Northern hemisphere), and I hope you are not all staying inside working on your conlangs, especially if the weather is nice. A breath of fresh air does wonders for one’s creativity! I myself am writing this column from the beautiful and sunny island of Corfu, taking my own advice to heart. And it is needed: as you may have noticed, I haven’t been very active as President of the LCS lately. Various circumstances have conspired to sap me of my energy, and I really need a recharge. So I apologise in advance for my lack of activity. I hope to get back on track in the next few months. As you probably noticed, the last few months the LCS has mostly been busy with the Paramount vs. Axanar court case. I will not focus on it in this column (our position has been clearly stated in the link I just gave, and you can check the links below for even more information). Rather, I will just repeat that by intervening with our amicus brief, we did exactly what the LCS stands for: to promote and further the art and craft of language creation, and to ensure conlangers and non-conlangers alike can carry on enjoying our craft without hindrance. And we will stay vigilant in the future, to ensure it stays that way. However, I realise that our focus on the Axanar case means we have not been focusing on our core activities, and I do understand if people find that irritating. I know some people have been asking these kinds of questions: “What about the next LCC?” “Where are the updated videos from the LCC6 that we’ve been promised?” “What about the LCS’s social media presence?” And so on… I could once again explain that we are a volunteer organisation with limited time and energy, but in truth I agree that we (and by “we” I mean “I”) have not been responsive enough lately, and I can only promise that we will pick up the slack in the next few months. Concerning the next LCC, like last time an email will be sent within a few weeks to the Members’ List kicking off the bidding round. However, you don’t need to wait for it: as I know some people are already doing, if you are interested in hosting the next LCC, don’t hesitate to start and looking for venues already. As for the updated videos from the LCC6, the fault lies squarely with me, and a lack of ability to delegate, which is why I hereby ask for help: if you have experience with video editing and are interested in helping to get the ground work done so we finally get HD videos of the LCC6 presentations, please contact me privately, so I can explain to you what kind of work must be done. I will also get back on track concerning our social media presence, so you can expect some kind of announcement in the next weeks. Also, don’t forget that your members’ benefits, as described at the end of this newsletter, are always available to you all. Don’t hesitate to make use of them. And if there are other things that we are not yet doing, but you think we should be working on them, don’t hesitate to contact us with your ideas. We are always looking for more ways to support the conlanging community. As usual, I can only say that the LCS wouldn’t exist without your support, and I hope you will carry on supporting us, even when times are hard and we (or rather “I”) have difficulties to stay on top of things. Your support does mean a lot, and helps us supporting you in return. Two common English verbs, “can” and “get”, which native speakers such as myself take for granted as seemingly simple words signifying simple concepts, are in fact minefields of outright semantic anarchy. In fact, if their semantic patterning were to be exactly paralleled in a conlang, the community-at-large would berate the conlang as being unrealistic, a joke-lang, or a sure sign of newbishness. Nevertheless, reality is stranger than fiction (as is usually the case) and the lexico-semantic bizarreness of these two “simple” English words is worth looking at if only to demonstrate that the great majority of natlang-style conlangs are too regular and too lacking in the subtly outlandish oddities found in real-world natural languages. In this respect, exploring the semantic patterns of these two English words is worthwhile for any artlanger or natlang-style conlanger. “be permitted to”, e.g., You can go now. “have the potential to or possibility of”, e.g., It can flood this time of year. “have the opportunity to”, e.g., I can ask about it when I arrive. “have the physical capacity or ability to”, e.g., Can you touch your toes? “offer to”, e.g., I can sing for you if you like. “know how to”, e.g., I can swim, can you? Anyone who’s studied Romance languages knows that the lexico-semantics of English “can” do not map in a one- to-one correspondence to those languages’ verb of potential/capacity, e.g., English “I can see you” = Spanish “Te veo”, French “Je te voix”. Unwinnable published an article about building languages in video games. Several sources provided articles about the Paramount v. Axanar case, including NPR, Hollywood Reporter, and Mother Board. Call for submission: Fiat Lingua publishes everything conlang-related, including reviews of conlang-relevant books, conlang grammars, essays on style, conlang criticism, scholarly work on a conlang-related topic, and conlang artwork and prose or poetic composition. If you have something you’d like to publish or have an idea you think might work as an article, email fiatlingua@nullconlang.org. All submissions must be in PDF format. Description: A discussion on last year’s Smiley winner, Kash. Description: An overview of online linguistics databases. Description: A discussion with Sai, Christophe, and attorney Mark Randazza about the Paramount v Axanar case. 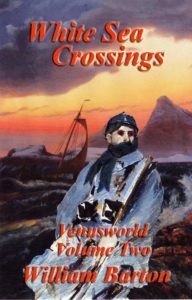 William Barton published the second book of his conlang-related SF/F series: Venusworld Book2: White Sea Crossings. We could of course imagine a similar thing with any type of possession - note that Uralic probably permitted using nouns and pronouns in the genitive as possessors of subjects. Semantically, though, it's obvious that subjects can be possessed - they might just maybe be slightly less likely to be so than objects and such, or there might not even be any statistical difference there. Now, we can start imagining interesting other differences: in English, for instance, "-'s" covers the same syntactical spot as "the" and other determiners. We could imagine that subjects generally either have a much more restricted set of permitted things in that position, or even none at all; maybe subjects in this language only can be subjects if they're definite, and other agents that are closely related to the verb must be in some kind of oblique position, or maybe there must be some kind of pseudo-definite dummy noun with the actual agent as an attribute of some kind. Imagine a language where the case markers of direct arguments of the verb show some kind of agreement with the gender and number of the subject. We come up with a set of object markers that - maybe with some syncretism - thus marks mostly the agreement features of the subject, but to some extent also marks some agreement features of the object. For the other cases, for arguments of the verb the congruence marker only codes the gender-number of the subject, and there's a separate morpheme marking the number of the argument. This number marker marks the gender of the noun itself, not that of the subject. For adjuncts of the finite verb and for both the arguments and adjuncts of infinitives, the noun takes its own gender's case marker. To illustrate such a system, I guess a three-gender system is suitable. Let's assume a very IE one, i.e. with three genders, one masculine, one feminine and one neuter. In the system I came up with , the masculine and feminine objects take their own gender's accusative marker as object marker when the subject is neuter. When the subject is of the same gender as the object, they take their own gender's default morpheme - the one used for adjuncts and infinitive objects. However, when a masculine subject and feminine object or vice versa occur, a special set of morphemes are used. Slightly more complicated in the singular than the plural, however, with more syncretism in the plural. Finally, for the other cases as arguments, a masculine singular subject triggers masculine singular case markers, a feminine plural subject triggers feminine plural case markers, etc. If the argument and the subject are of the same gender-number marking, the argument's own number-morphology is lost. ŋolmi - manners, with regards to family. The familiar comitative does not have congruence morphology of its own, but uses regular comitative morphology on adjectives. Both masculine and feminine singular nominatives have a zero congruence marker on adjectives. Demonstratives distinguish the two, however, as do a few other quantifiers and determiners. The ablative's adjectival congruence marker is identical to the regular oblique marker in the singular. For non-nominative NPs, any intervening adjective takes an oblique, gender-specific morpheme. The cause for this system seems to be providing cues as early as possible for parsing. As can be seen, the oblique masculine marker is -ə, the oblique feminine is -i. In the plural, they are -eg (masc) and -el (fem). For complements of verbs, the oblique markers are used if the state expressed is fairly constant, i.e. 'he is tall' or the like, whereas if it is more temporary, no congruence marker is used. Another new number word. This one is more Finnish than Basque, but I think not unreasonably so. When I originally posted this, I wasn't sure if the word fifteen occurred in Alice's Adventures in Wonderland or not. I didn't have a searchable text handy. Now I can happily say fifteen appears once in the book. "...she came upon a low curtain she had not noticed before, and behind it was a little door about fifteen inches high: she tried the little golden key in the lock, and to her great delight it fitted!" I'm not sure if the word fifteen occurs in Alice's Adventures in Wonderland or not. I'll update this post later when I find out. Q: To where are you going? Q: With what are you going to build it? A: Blood, sweat, tears, nails, wood and a hammer. My conlangs have slightly differing approaches to responses. Ŋʒädär permits case preservation, but also permits some non-preservation - oblique cases that are not preserved are replaced by the locative, whereas dative, genitive-comitative and complement cases are replaced by the absolutive. with what do you intend to build a house? * the meaning of -ŋö- varies with the verb root and with surrounding morphemes. Ćwarmin requires case preservation, except with direct objects and quirky case subjects: for all of these, an answer in the nominative is permitted. Q: (s)he what-from?where is he from? Sargaĺk preserves case except the pegative, which is replaced by the nominative in short answers. Dairwueh preserves case except in situations involving quirky case, where the nominative or the accusative can appear instead, depending on whether the noun asked for is subject or object. One minor exception is that nominative interrogative pronouns with transitive verbs can take genitive nouns as answers, if the noun given for the answer is definite. Finally, Bryatesle does not preserve secondary case ever in short answers. Subjects and objects can preserve case, but may also be marked by nominative (regardless whether it's subject or object, or even quirky case subject or object that is being asked for). The two other cases can be preserved, or be given in the answer in the accusative case. This would qualify as a preposition on syntactical grounds - whatever syntactical differences you find in the language between objects and prepositional phrases, you'd need to have this line up with the prepositional phrases: this might include omitting object marking on the verb, not permitting certain transformations, requiring the noun to be in some specific case. We could also restrict this from combining with other prepositions, thus making 'by him', 'from him', etc not distinguish reflexive and other third person. If the language permits reflexives in subject position (which some languages do in positions such as 'he1 doesn't know that he1's won the lottery', this could be made interesting by requiring a verb voice that lacks syntactical subject altogether, and for which the 'eg [Noun]' phrase is the demoted subject. You are currently browsing the Conlangers blog archives for June, 2016.